We are slipping slowly into fall, here, in the south. Warm days and cool nights are perfect for throwing your windows open wide and letting the autumn cross breezes blow through your screen doors and windows. The sound of rustling leaves is hypnotic and the sky is a brilliant blue. These are the days I love to meander looking for treasure and it won't be long before the apples are ready for picking at our North Georgia orchards. My honey is already planning our first road trip for apples and antiques and I can't wait. 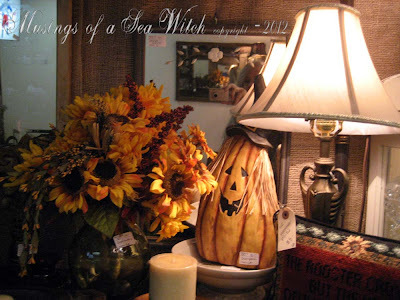 So enough day dreaming of fall pleasures and let me share what I found this weekend. 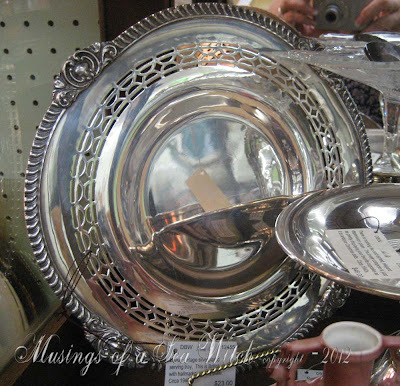 I know, I know...in fact "you know" I am crazy about quadruple plate. This pretty and very big sugar bowl looks more like a small trophy. 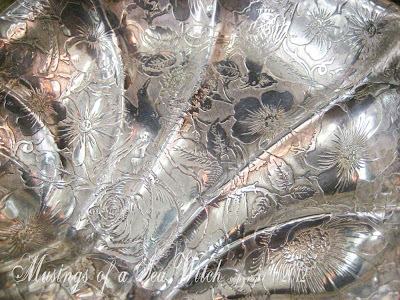 Nearly all of the silverplating is long gone and the base metal is now exposed, but I love the gun metal finish and it is perfect for use in holiday decorating. 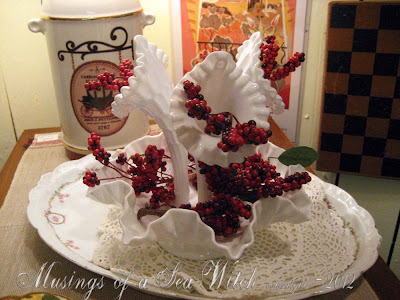 Pretty pair of Depression era salt and peps. 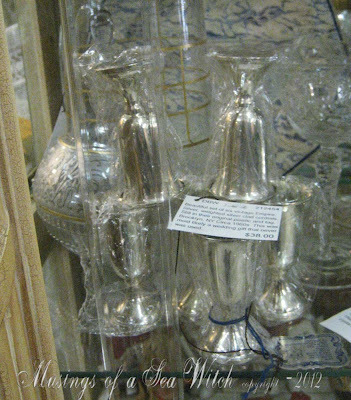 Most of the silver is still on the bases and the tops are still intact if not a little worn for wear. 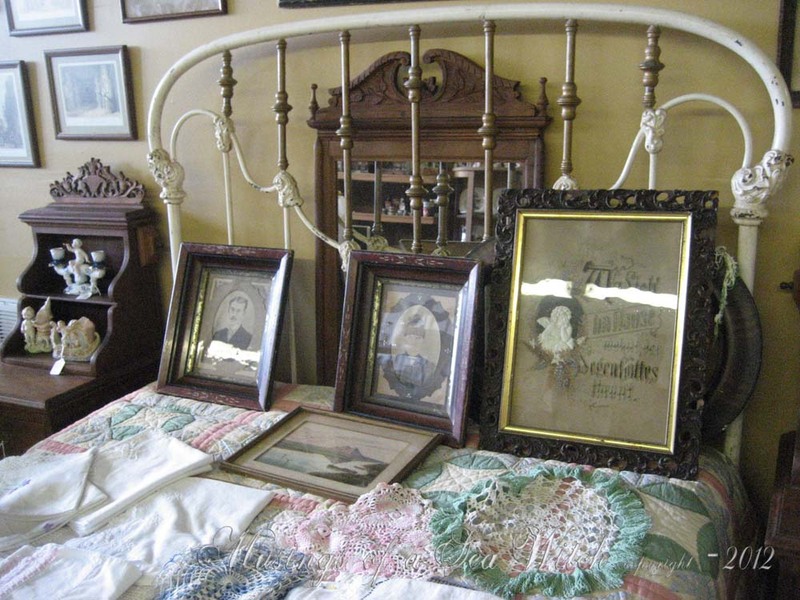 Pieces are dated 1929 and are heavy. Found this cool frame at my local goodwill so I added more of those Victorian changing stickers. You go from pretty Victorian photographs to ghostly images. 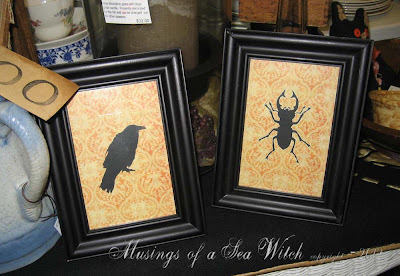 Also found these pretty little gold leaf frame mirrors that I added crow stickers too. Brought them in on Sunday and they sold the same afternoon. I love Victorian rose bowls and this pretty contemporary version is a small cut crystal rose bowl. Perfect for a single full blossom of your favorite flower. Closeup of hand embroidery and cutwork. One of my two prize finds this weekend. This pretty Weller Pottery piece. Circa 1932 and from their Elberta series. Brilliant yellow and green in the coveted matt glaze. I love it when I can find these kinds of pieces in the south. Found a service for five, yea, I said five, go figure...of gold plated flatware. Also had a serving fork and spoon as well. Barely used and brilliant with its finish. 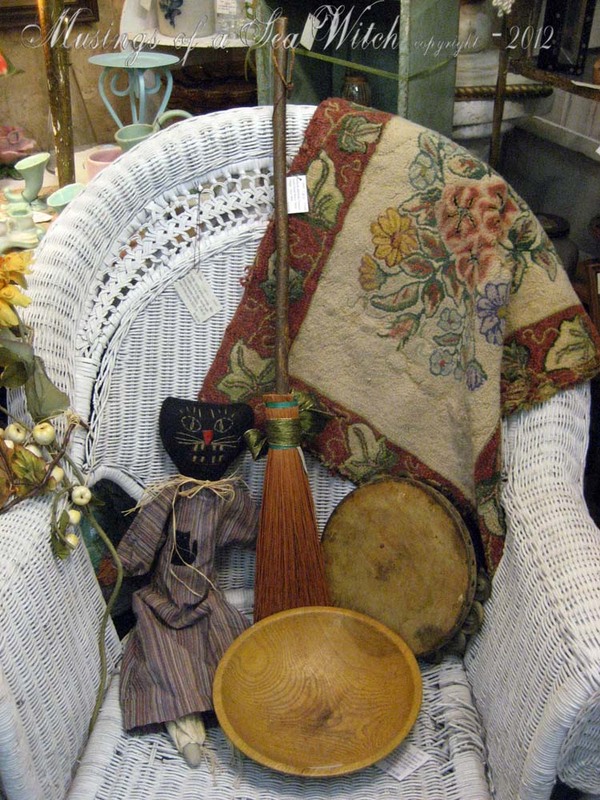 Pretty woven pine needle basket with unique star pattern in weave. How cute is this little 1930s embroidered quilt piece? Perfect for a child's room. Found a pair of authentic Venetian masks from Italy at another Goodwill I visit. This is a full face mask and is in brilliant blues and gold brocades. 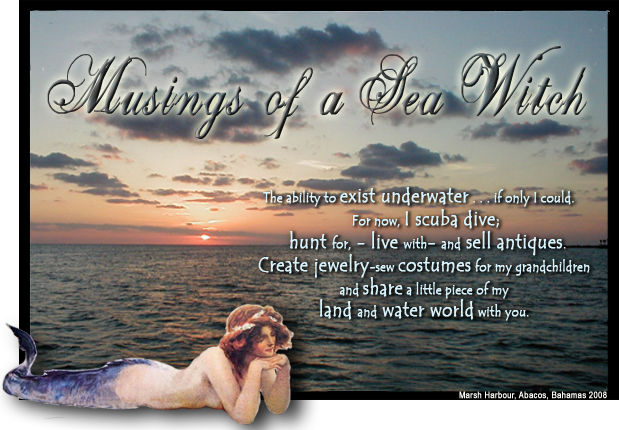 Can be worn or hung on the wall. The second of the two Venetian masks that I found. This one is a face mask that ties and is in gold and green with sheets of music on it. A photo of my expanding fall/Halloween display. Like Christmas and Valentine's Day, Halloween and fall items always fly out of the booth. Isn't she just beautiful. Found her at a thrift store and had to take her home. Dated 1911, this is a lovely, sepia toned photograph in original frame. 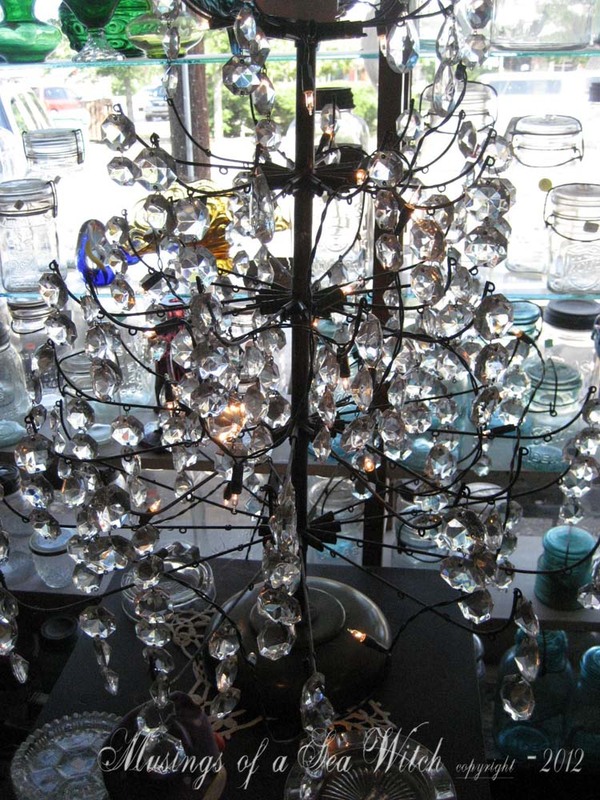 Sold another lamp so I brought in this twin pendant chandelier. Love the spun matt pewter and scroll work of the piece. And finally, a really cool vintage Heinz ketchup bottle with the original labels from 1904. Notice that there is no cap. This bottle requires a cork/cap setup. Bottle is full of stretch bubbles as well. Halloween decor is here. It's in every store I walk into and customers ask for and are purchasing it now. 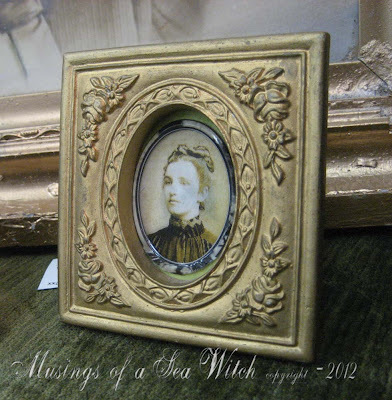 The pieces I brought I brought in last weekend have already sold so it's time for another round of interesting pieces. I made these pictures a few years back and they sold like hot cakes so I made another grouping. Brought in 7 and these 2 remain. Someone likes my creepy prints. I like vintage Halloween when I can find it. 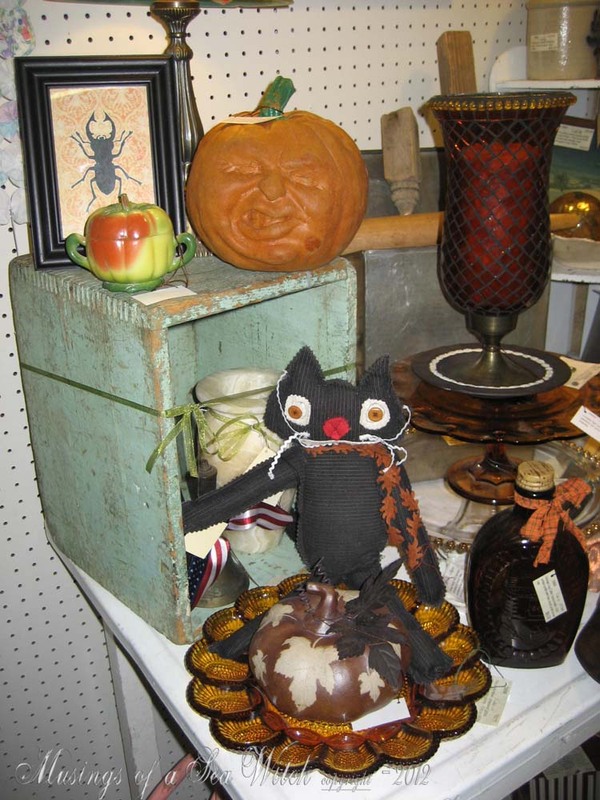 The black cat is a new, folk piece but the nerf pumpkin is from the 1970s. Everyone needs a witch's hat to display and a pretty little mini frame of a raven. 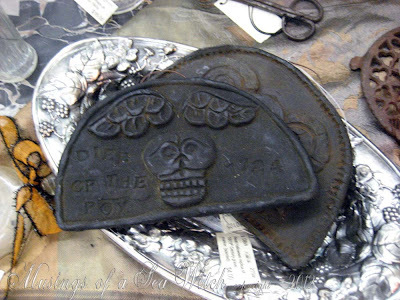 I found these gravestone marker cinnamon scented pieces last year. I love the 18th century look they have. 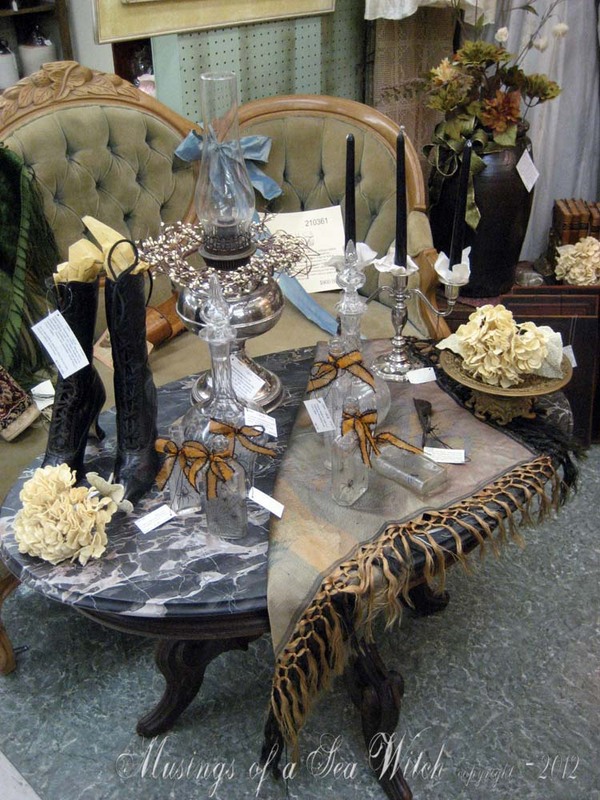 Selling items right off of this antique marble table faster than I can bring items in. This weekend was a silver bonanza. And all were found at my local Goodwill's. Someone must have cleaned out their grandmothers display cabinet because these pieces were amazing. 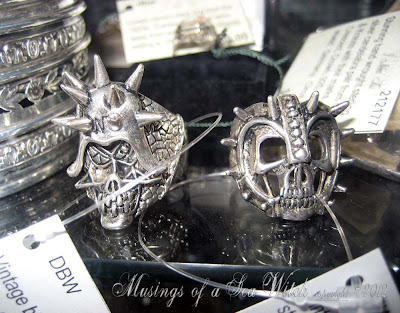 Let's start with this pair of very, heavy sterling biker rings from the 1980s. Not normally found in your mother's display case, but hey, momma must have had bikers in the family. Big, heavy and oh so "Sons of Anarchy". Biker jewelry remains a highly collectible arena. One of my favorite finds this weekend. Six, Birks Sterling Silver, cut crystal coasters. These were marked $3.83...I had to get them. Six cordials, in their original plastic bags with their label, Empire Silver Company, Brooklyn, NY. These pretty cordials were most likely a wedding gift that never got used. 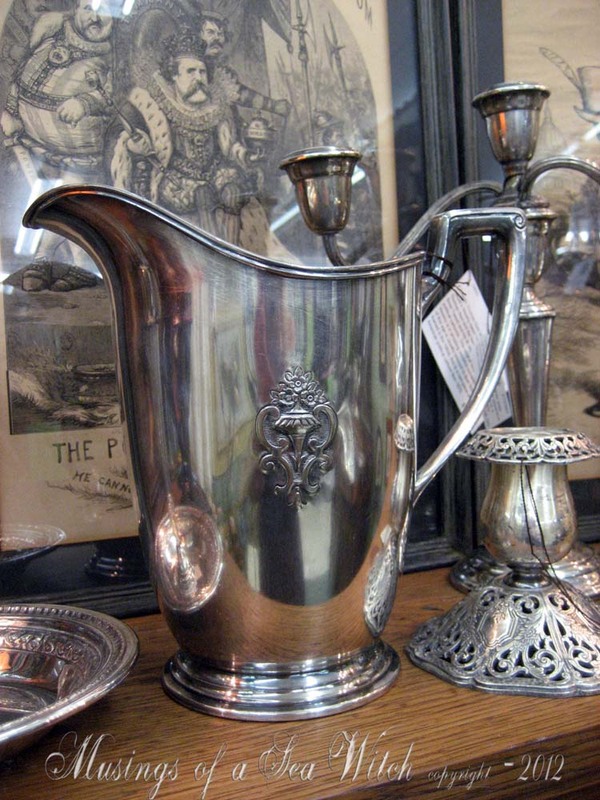 Beautiful, Wm Rogers & Sons, silverplated water pitcher from 1929. Pattern is Princess. 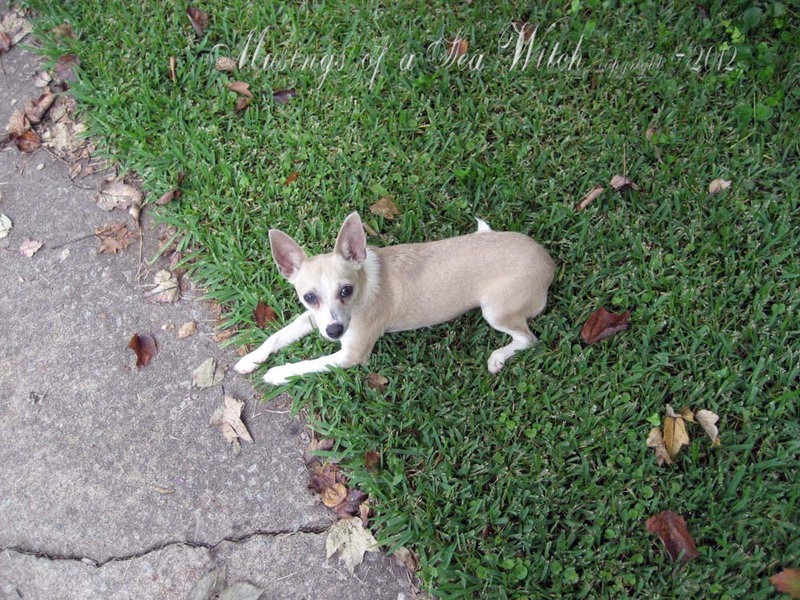 Wm Rogers offered two different patterns called Princess. This is the earlier pattern, the other was offered in the late 1940s. Love, love, love this pretty little server. Hand hammered markings on back with a hallmark I have yet to identify. 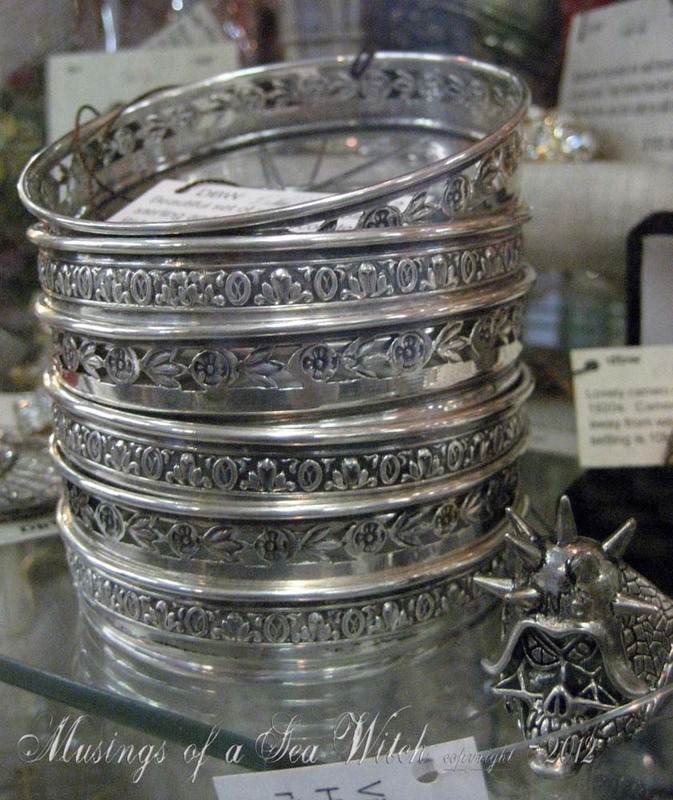 It is quality silverplate and embossed with flowers and pheasants. Close up of the patterns. Such a pretty piece. And finally, a lovely British hallmarked serving tray. 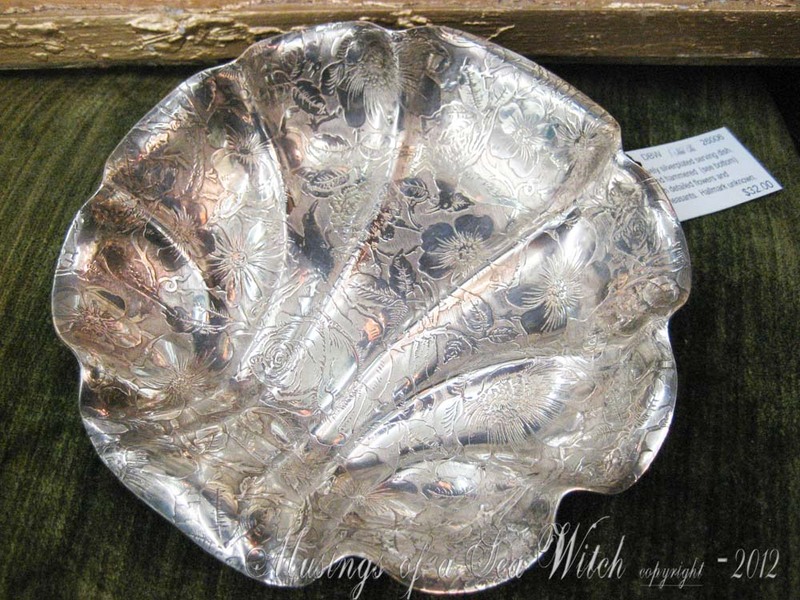 This is a smaller piece, approximately 10 inches in diameter with heavy silverplating and British hallmarks on back. Circa 1930s. The world is in such hurt these days. I find myself angry over these violent and murderous acts that continue to plague humanity. A friend reminded me of this trio of achingly brilliant voices and so I share one of my favorites with you. These voices calm my angry heart. Beautiful words and incredible melodies. Tis true, music soothes the savage breast. 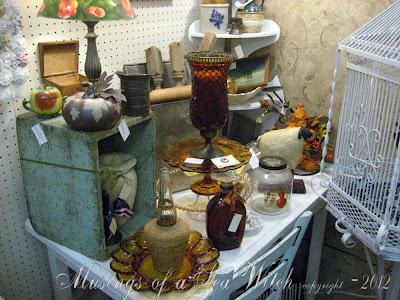 My honey and I took a road trip to Elberton, GA over the long Labor Day weekend where he could do a little shooting of sporting clays with friends and I would do some antiquing in a small Georgia town that I had not visited. A pretty Saturday morning that quickly turned into a hot hot hot day but that was not going to stop me...or was it? Well, the oppressive heat we had wasn't the only downside to the start of this trip. 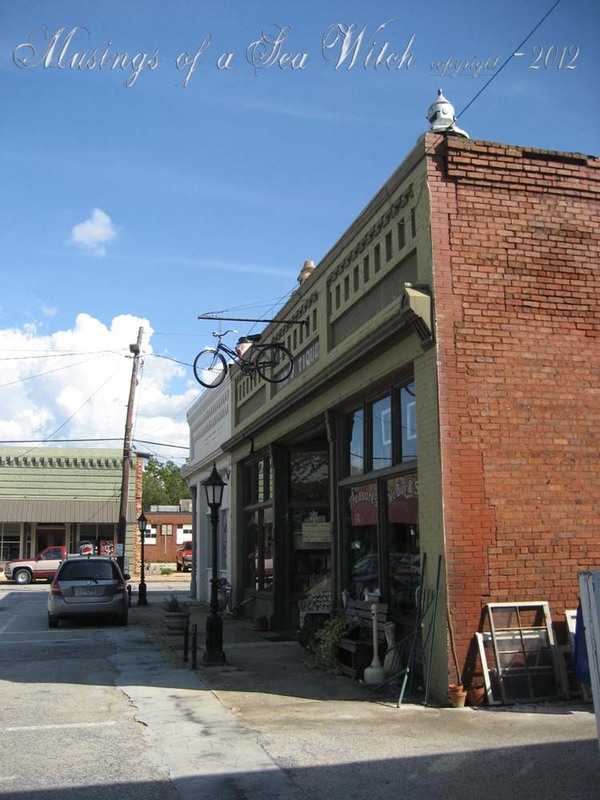 Elberton is a pretty little southern town with a community town circle that is undergoing a lovely revitalization. 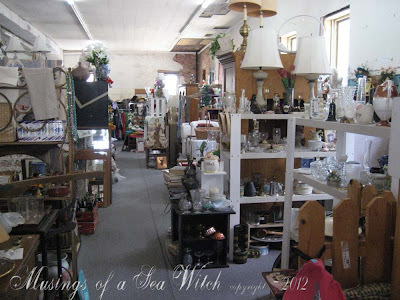 There are two antique stores in Elberton, one just outside of town in an old home and one in town with lovely windows. Both were shut tight. WHAT???? No sign saying they were gone for the Labor Day weekend. Just closed. At 12:30pm on a Saturday, I expected both to be open. So, what do I do with 3 hours to kill while my honey was shooting clay birds? 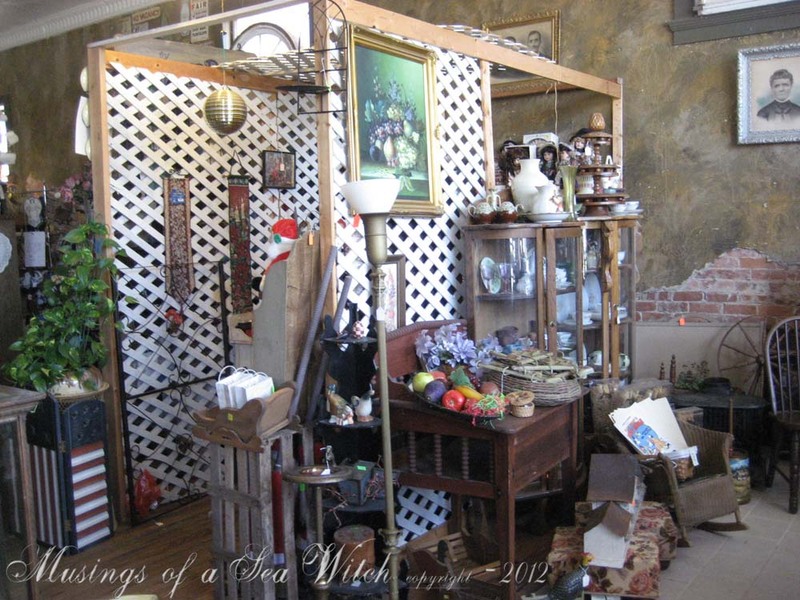 Well, grabbed the map and looked for a town that was close by, grabbed the smart phone and did a search for antique stores and Washington, GA showed up. So I grabbed another bottle of cold water and headed down the 32 miles to this little Georgia town. 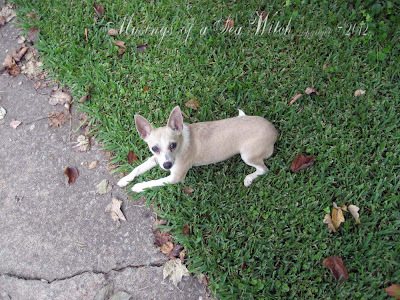 Washington is a beautiful community with gorgeous antebellum, Victorian and colonial homes along tree lined streets. The town circle is bustling and filled with interesting shops and restaurants. Surely I would score something here. Looks promising. Nice old building with pretty things outside. Carved into the building are the words, Izzie Always Busy. Couldn't find anyone who could tell me this story, but I'm still looking. At first glance it looked like I found a source for treasure. But as I walked the aisles it quickly became the place where garage sales come to die. Lots of bad, yard sale rejects, piles upon piles of used clothing, lots of, well, just junk. So I returned to the car and head back to Elberton to pick up my honey. He had a marvelous afternoon shooting with friends and after I shared my story of disappointing treasure hunts he said he was going to take me to a neat little town he had passed through the last time he had shot in Elberton. 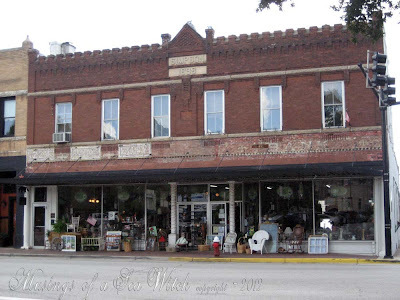 A short drive of 20 miles and we are in the town of Bowman, GA. Sweet little town and very small southern community, it is easy to just drive on by. Don't. Take the time to stop in...it is small, but oh, what a gem. 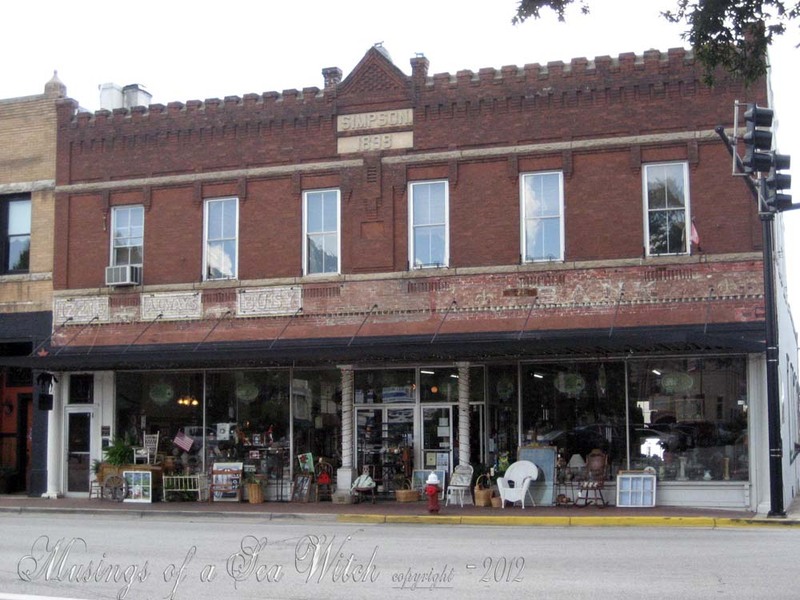 Very small "L" shaped town with pretty to see, old buildings that have all been revitalized and are home to antiques and repurposed furniture shops. Anyone who hangs a bicycle out as a calling card for their antique store is my kinda merchant. 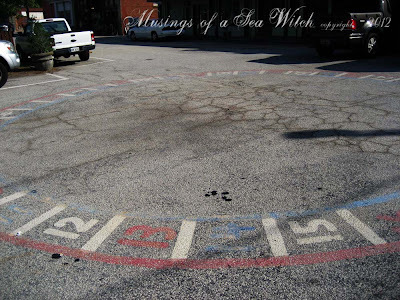 Painted on the center of the town square is this large, numbered wheel. I had never seen one before and assumed it was part of a community carnival game but I didn't know how it worked. Anyone know what this is? Well, I entered the shop directly across from the wheel and asked the lovely woman at the counter what this was. "Well, darl'in, this is for our community cake walk." It's for a cake walk!!! How marvelous. Can you get more small town America then this? A Cake Walk wheel, this just make me smile everytime I see it. 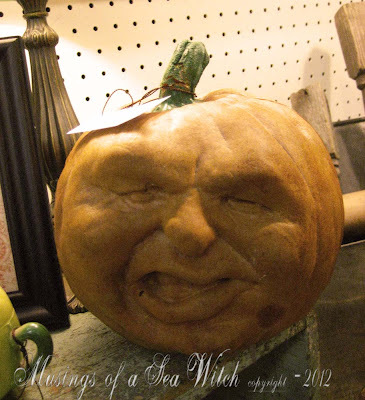 Bowman has a Fall Arts and Music Festival each year and the 2012 date is September 22nd. I bet there will be some delicious, homemade prize cakes at this walk. I wonder if I can talk my honey into taking another trip back to Bowman...there may be cake? These shops at Bowman were lovely. So many beautiful antiques, nice vintage pieces and repurposed furniture and the prices were good for both the collector and the dealer. 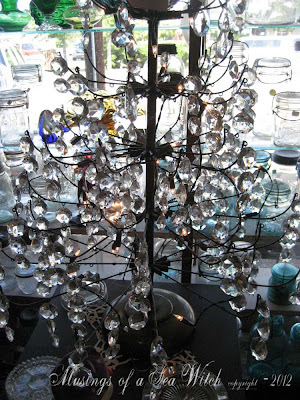 A wire tree with vintage prisms stole some of the setting sunlight and cast rainbows along the bottom the floor. 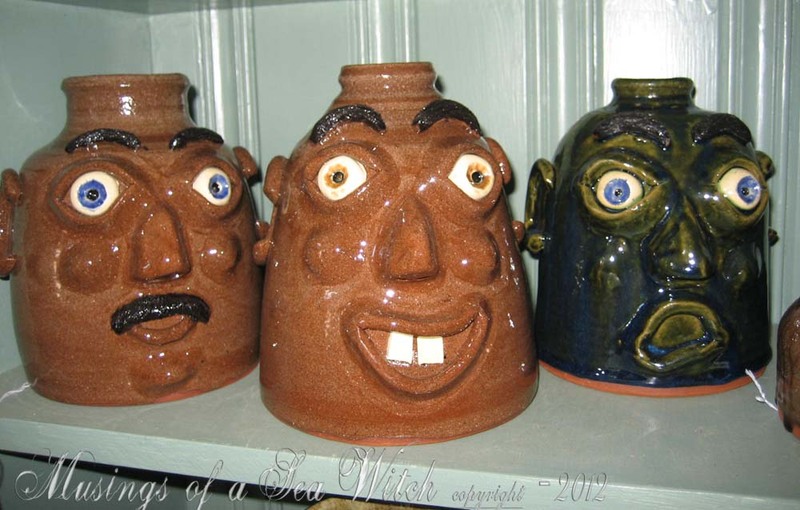 Face jugs are highly prized by the southern pottery collector and first made by slave potters out of South Carolina. The south now boasts many southern face jug potters. 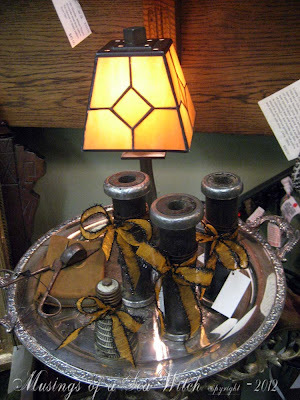 These are full of whimsy. 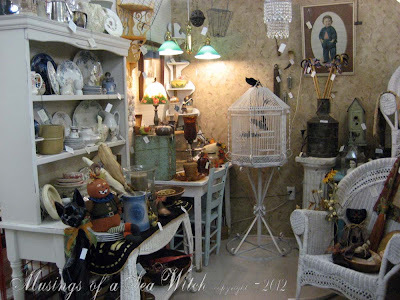 This shop was filled with Southern Primitives. 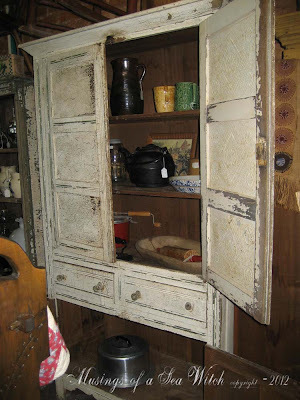 I know European, especially French pieces, are so popular these days but I am a die hard fan of American antiques, especially primitives and these southern pieces were fabulous. Smashing pie safe with hand pierced tin front and original milk paint...be still my heart. Lovely iron and brass bed had just as fancy a footboard as this headboard.This shop had so many interesting things and I did purchase a few treasures here. Now I know this old wood stove made plenty of hot, corn bread and other delights. 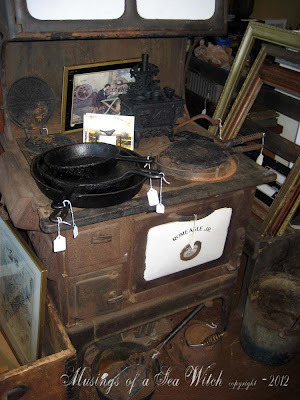 I like the old skillets on it as well as the toy stove. I came home with a marvelous, Clayton County, GA butter churn/storage crock, a sweet little work table, and WW1 print of a lover morning the death of her soldier. We had to leave Bowman about 40 minutes after we arrived as it was nearly 5:00 pm when we pulled in. I fell in love with this pretty little community and can't wait to get back again. 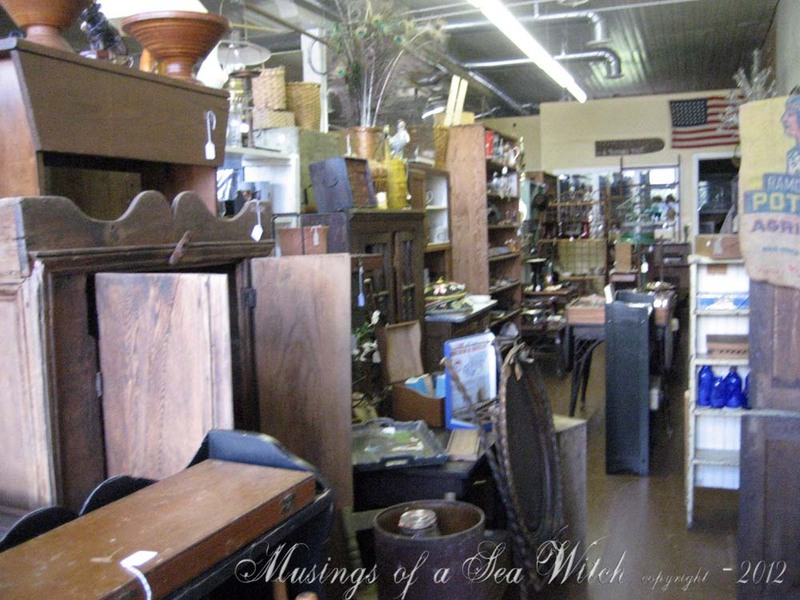 This past weekend, I made another trip to Vintage Village as new dealers had come on board and the existing dealers are bringing in more Halloween and Fall items. 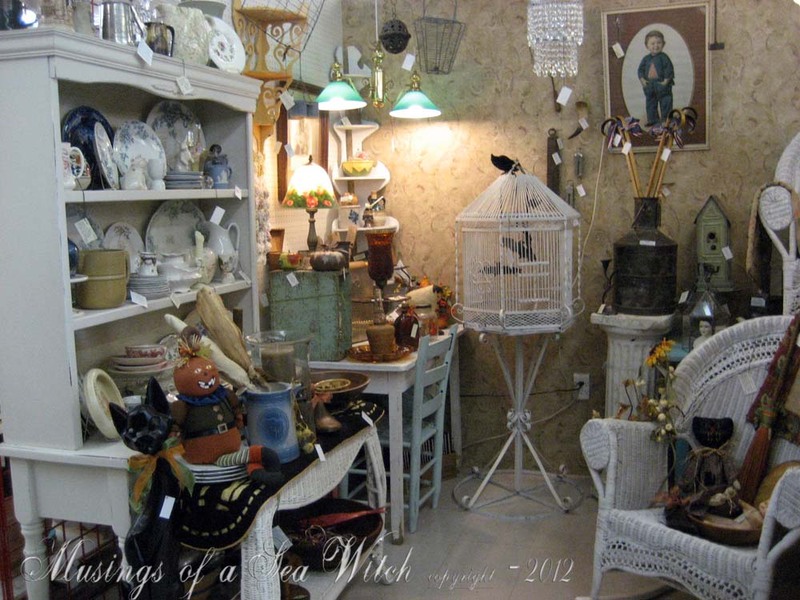 I'm just adore this time of year and VV has always had some of the best that fall has to offer. 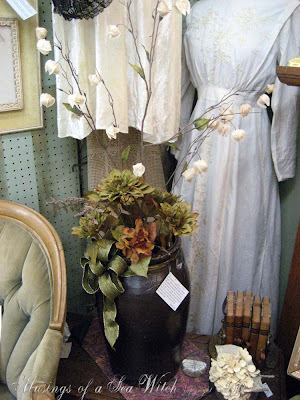 One Vintage Hag, the owner of Vintage Village, always has the prettiest displays. These brilliant flowers and delightful pumpkin shout fall. 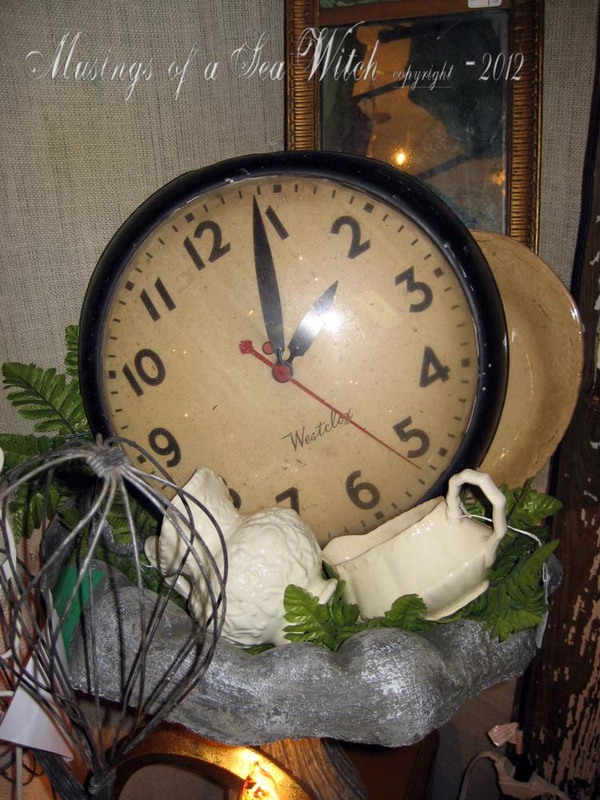 It's about time and this marvelous, vintage wall clock is a beauty and it works. 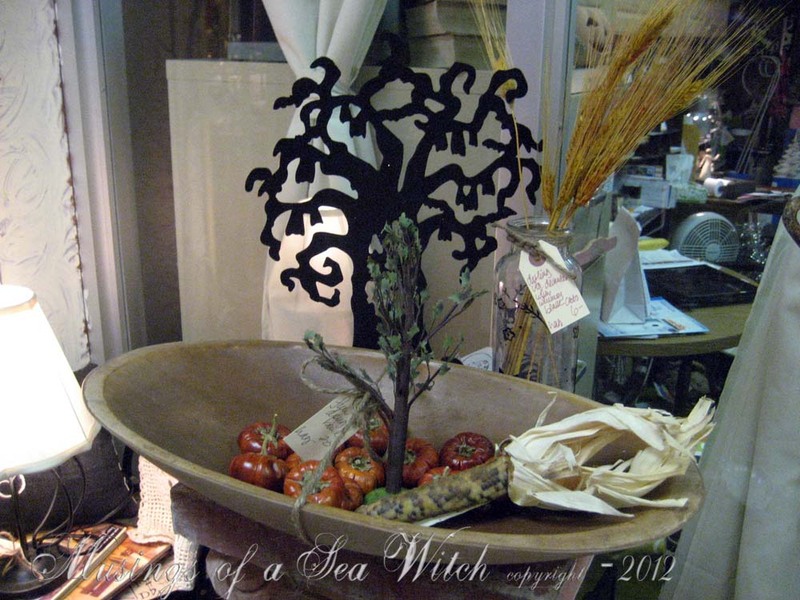 Marvelous treenware dough bowl filled with little faux tomatoes, Indian corn and a glittered witch tree. Pretty powdered like hydrangeas. I bought three and may go back for more. 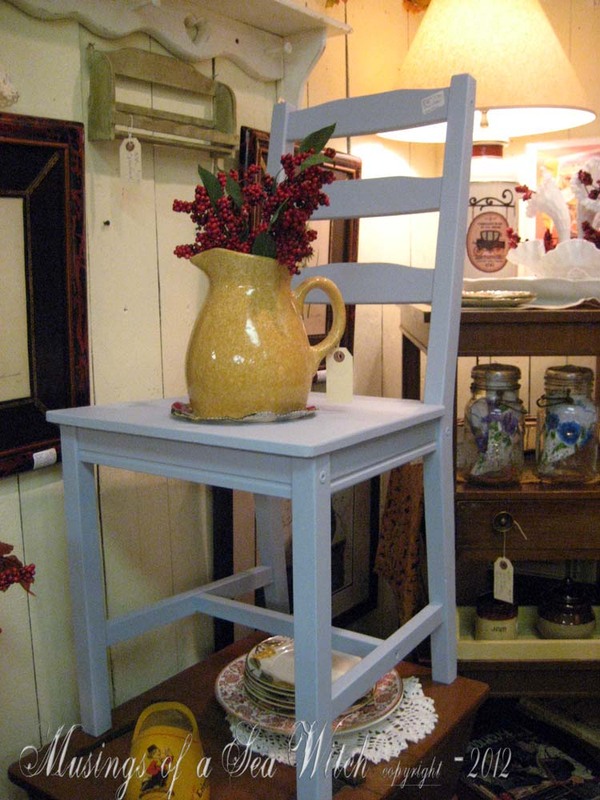 Love this pale, french blue straight back chair with the yellow stoneware pitcher filled with bright red berries. 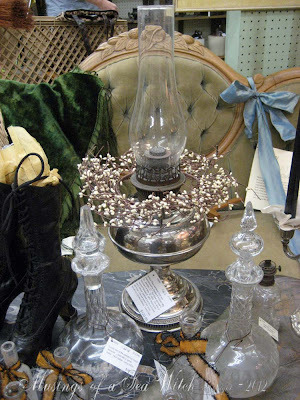 Nice, milk glass epergene. These are getting harder and harder to find. 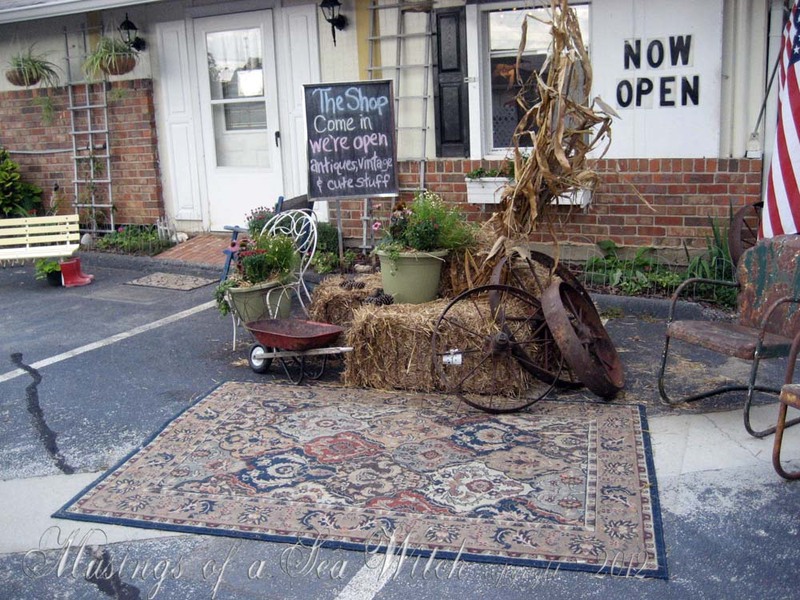 The Shop behind VV always has an interesting outdoor display and I love the whimsy of the Persian rug and farm implements display. All of this autumn color has me working my booths to get ready for our busiest season. So I'm bringing in Halloween and fall whenever I can. Remember my sisters white cat with the weird orange eyes? Well I took it home and painted it black and added a sassy ribbon. Now this is a Halloween cat. The pretty black commercial spools I purchased at the Flowery Branch Auction house are now decorated with pretty fall ribbons. Took mini gold frames and added pretty vintage photos of a Victorian woman and a man. 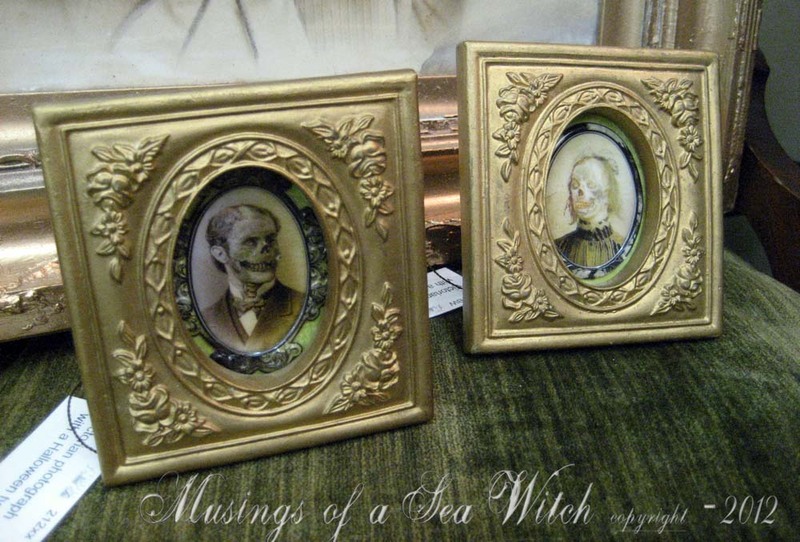 Oh wait, the photos have turned into creepy ghosts. Thanks to some really cool stickers I found at Michael's. These were in the store 24 hours and sold. Now I have to make a few more. 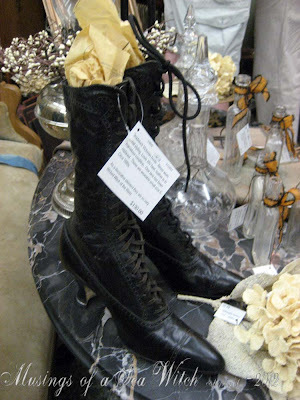 Fantastic pair of Victorian dead stock boots. 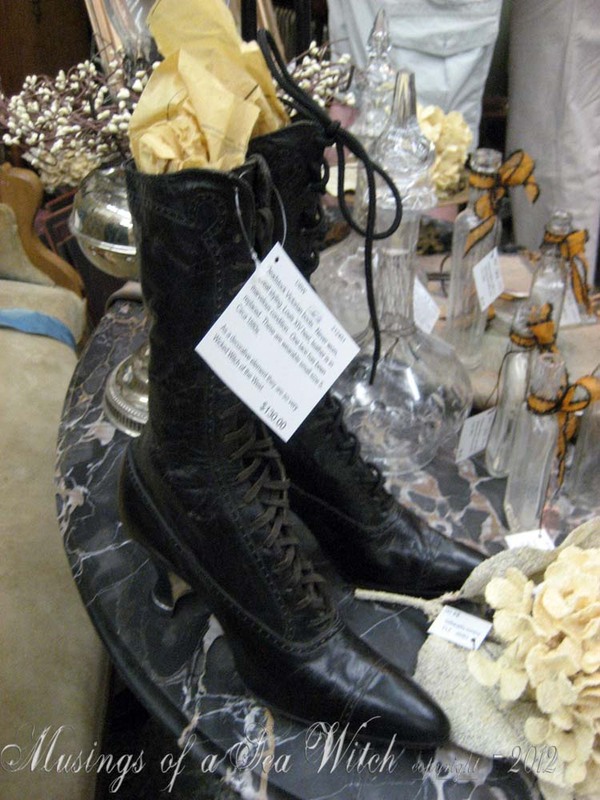 Never worn and these have that always in demand witchy heel and toe. 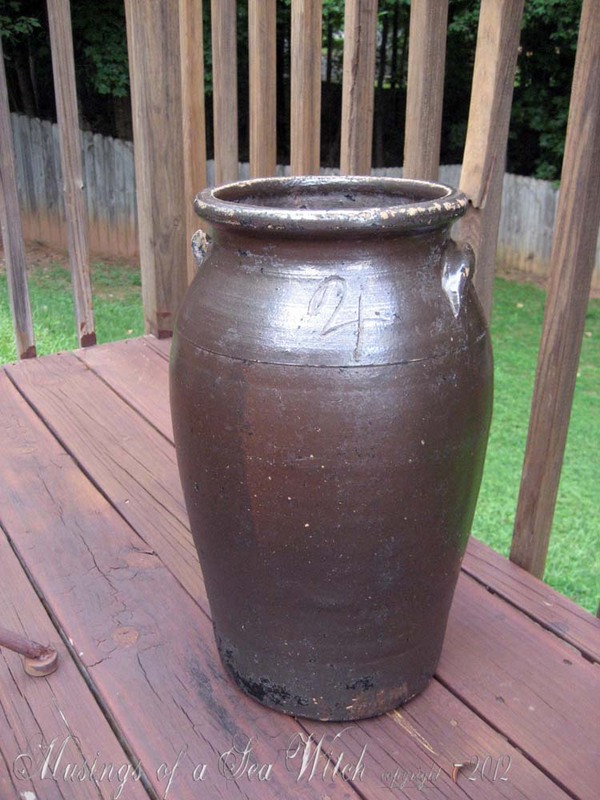 The marvelous Clayton County, GA with Albany slip glaze and hand incised 4 gallon butter churn/storage crock I found in Bowman, GA. A great piece for the southern pottery collector. 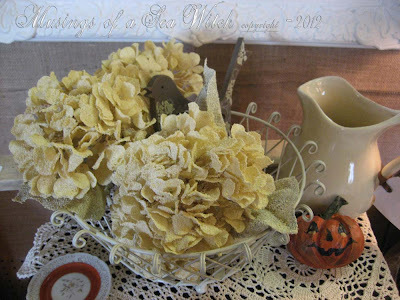 I added a pretty fall ribbon and filled with autumn flowers. 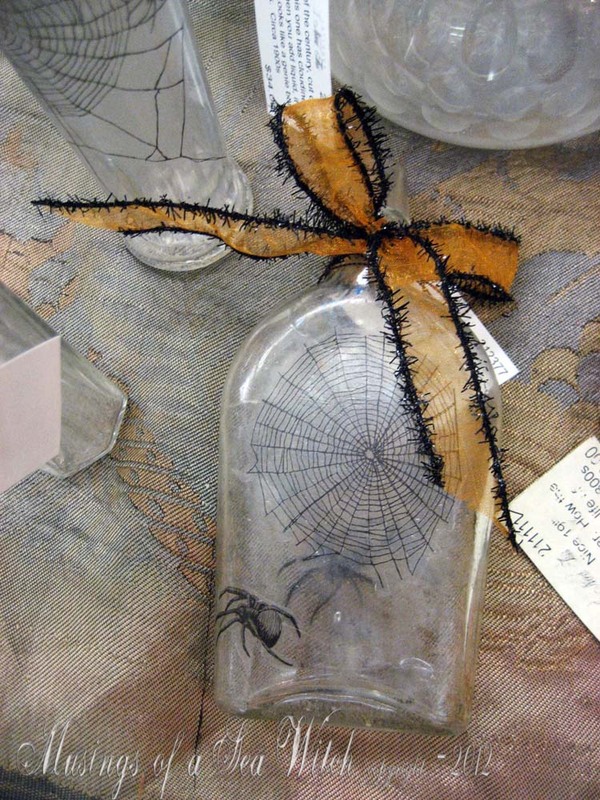 Remember the antique bottles/flasks I picked up at the Flowery Branch Antique show a few weeks back? I thought they were perfect for Martha Stewart's spider decals. Now they have a great spooky look to them. A local Goodwill find, this terrific Rayo kerosene lantern is missing its diffuser but I think the white berries give it a pretty fall look. 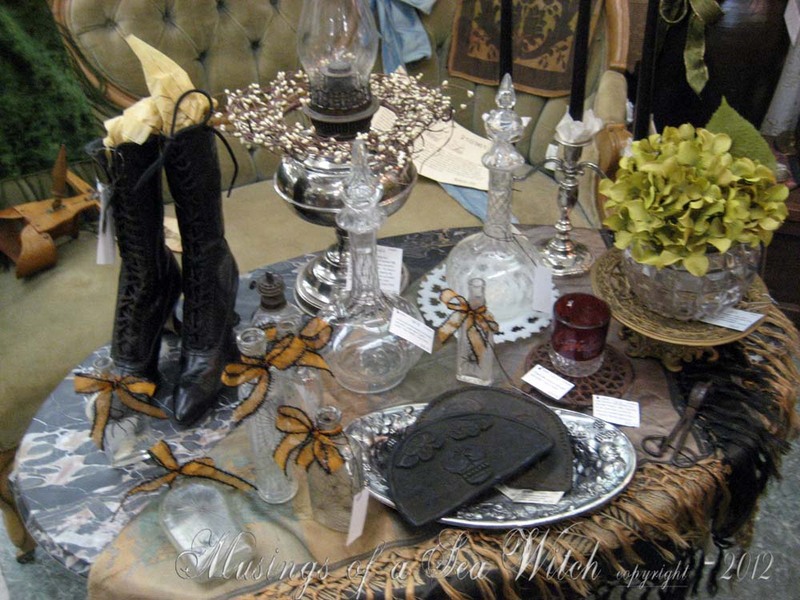 My display of Victorian halloween items. 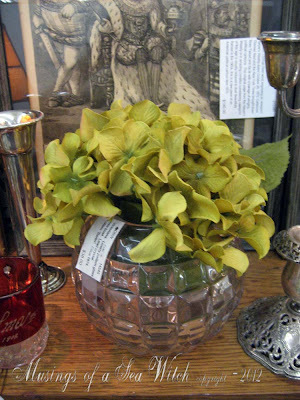 Pretty Victorian rosebowl is filled with yellow green hydrangeas. Found the neat hearth broom at Vintage Village. 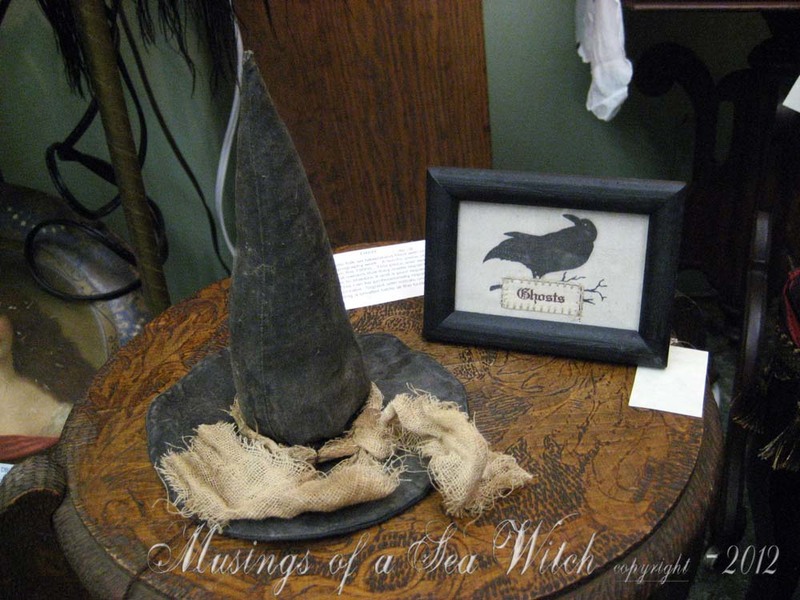 Everyone should have a magic broom in the house. I moved the big display case out of the corner and put it in the front of the booth. 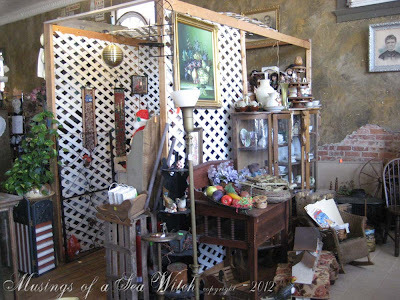 I am trying to get ready for the holidays that are soon fast upon us and need to maximize the booth space. More autumn pieces on an old enamel 40's table. 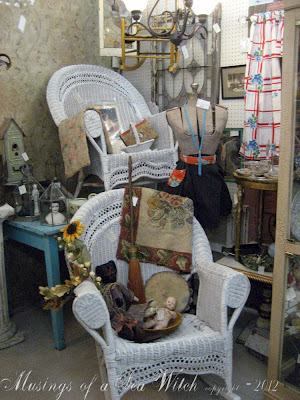 Lots of room now that I moved the case and the wicker rockers are easy to navigate around.